San Francisco is a great Mural Town. Throughout history, murals have been used to communicate the scale and drama of the artists' themes. Mission District murals often depict the struggle for human rights and freedom by the working class. 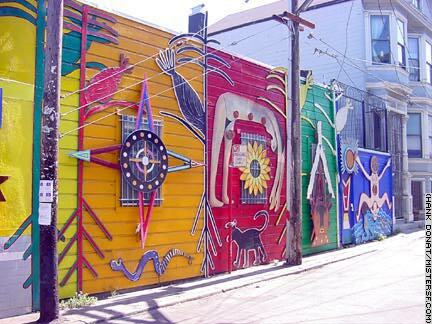 Choose the links to see how San Francisco paints the town. Detail VI: Bethany Center, 580 Capp St. Detail VIII: 1313 South Van Ness Ave. Detail X: St. Peter's Rectory, 1200 Florida St. Detail XII: Precita Center, 534 Precita Ave. Detail XIII: L. Flynn Elementary, 3125 Cesar Chavez St. Detail XIV: Cesar Chavez Elementary, 825 Shotwell St. Detail XVI: 434 Ellis St. Detail XVIII: 375 Frederick St.